prevent unwanted pregnancy? Does she now sell or patronize contraception? Encouraging young unmarried people to go for s*x as long as they have their contraception? No,never!! There is something new in global market. It is a small plastic device wrapped with safe and natural copper device that is placed in a woman’s womb to prevent pregnancy for up to 10 years. They also say that it is a non-hormonal contraceptive that is safe, affordable, widely available and can be used by different category of women. I now ask: What has happened to condom?Is it reasonable that at the moment it has been discovered that condom has a high percentage failure rate which has made a good number of people to turn away from illicit s*x in other not to have unwanted pregnancy that some people somewhere have to come out with another kind of contraception,just to encourage immorality? Unfortunately,these are people looked unto,to fight against moral decadence in society! For the fact that cigarette companies has warning for smokers of their products that they are liable to die young,doesn't mean they have the interest of people at heart. No,otherwise,they wouldn't have produced death trap for people in the first place. Lydia IUD wants to help people get free from unwanted pregnancy but at the same time,encourages them to engage in premarital s*x as well. She says in part: ''If 100 sexually active women choose not to use any contraception 80 to 90 will become pregnant in a year. If the same 100 sexually active women choose to use one form of contraception or another about 20 to 30 will still be pregnant due to human errors and negligence around the use of the methods chosen. If the 100 women then choose to use the Lydia IUD only 0.8% may get pregnant which is negligible.'' 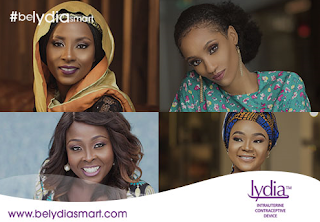 Here,Lydia implies that her contraceptive is far better and more reliable than any others in market,in terms of preventing unwanted pregnancy.